Discover the modern skyline and unique history of Abu Dhabi during this 8-hour trip including lunch at the luxurious Emirates Palace Hotel. Stop by the Grand Mosque, one of the largest mosques in the world, and get a glimpse into Abu Dhabi’s history at the Heritage Village, a recreation of a traditional desert oasis. You’ll also shop for high-end souvenirs at the Abu Dhabi Marina Mall and cap it off with an opulent lunch at the Emirates Palace Hotel. 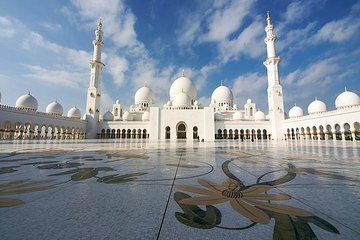 Your Abu Dhabi visit also covers a guide and round-trip coach transport form your hotel. Passeio muito lindo, Abraços a Margarita! My wife and I thoroughly enjoyed the tour. The tour guide was very interesting both as a person and knowledgable as a guide. We enjoyed our entire day with her. The driver for this tour showed 30 minutes after he said he'd be there. He then drove us over to another hotel where we waited for an hour for a bus. When we were finally on the way to Abu Dhabi it was a beautiful enough drive. We were the only couple on the bus that had purchased the lunch in the Emirates palace so the driver dropped us off in the palace for 50 minutes. How do you eat a nice lunch in 50 minutes? The bus picks us up and we are driven over to the mall where everyone else was having lunch and we have to wait for 30 minutes for them to come out. Would've much rather had that time to finish my lunch. We then go to Ferrari World and was given 30 minutes to look around. Everyone comes out except one person and we all have to sit on the bus for 40 minutes waiting for her. This was very expensive for what it was and more time was spent waiting around than actually doing anything.